Super Castlevania IV is a platform game developed and published by Konami and the first Castlevania game for the Super Nintendo Entertainment System, as well as the fourth in the series overall. It was released in December of 1991 in the US. It was also released on the Wii's Virtual Console on December 25, 2006. It is a retelling of Simon Belmont's foray into Dracula's castle, first told in the original Castlevania. 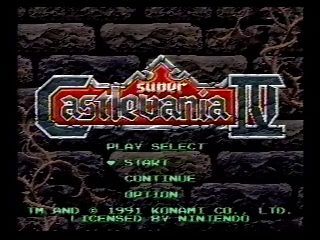 The game has all new levels (several featuring areas outside of the castle), 16-bit graphics featuring SNES Mode 7, and the soundtrack consists mostly of brand new pieces including a handful of remixes of previous Castlevania songs. Category note: Picking up no whip upgrades or sub weapons is equal to low% in this game. Best time: Single-segment 0:31:55 by 'Furious Paul' on 2015-09-06. Best Low% time: Single-segment 0:41:21 by Jeremy 'DK28' Doll on 2014-10-01. Single-segment 0:31:55 by 'Furious Paul'. My run through Castlevania IV was pretty flawless, there were only a few minor mistakes along with losing 7 seconds to a 2 cycle mummy (on stage A). I also took the stage 9 spike jump safe for the first time since I started doing it 7 months before the run, so I lost 1.5 seconds there. But everything else was great. I got a 1 cycle chandelier (which is the fastest), also a 7 cycle Slogra and 6 cycle Dracula. I am extremely happy with this run, all the hard work, many hours, and patience all paid off. It took me an average of 1.7 years playing about 6 hours per day to create this run. A sub 32 minute run for this game is crazy and takes a lot of practice to achieve. I do know that a sub 31:50 is possible and I am currently working on that right now and you can watch me do that Live on my twitch channel. If you are wondering what are some of the hardest strats to do in the game are, check out this list I put together for the top 15 hardest strats for Castlevania IV. You will find some other cool info relating to Castlevania IV on my website as well. Single-segment Low% 0:41:21 by Jeremy Doll. So thank you as always to all SDA Staff! You guys are so awesome for keeping the site rolling over the years. Also, big 'Thank you!' to Joe Damillio. Your support and insane contributions to the route helped make this run happen! Many of the strats here were discovered with Joe's help. Thanks to FuriousPaul and Just_Defend who I also learned some things from. Also, thanks to Mr K for doing a lot of research for me and ultimately helping figure out the Viper fight. And many thanks to Zallard1 who lent me his Gamesaver, this was the tool that truly helped unlock my technique to achieve this victory. The Tale of the Vampire Killer. Castlevania IV Low%, this has since been defined as no Whip upgrades and no Sub-Weapons. Meat drops, Rosaries and Invincibility Jars are allowed. A quick summary, this game can be seen as easier than most Castlevania games for casual play. Simon's upgraded Whip is deadly and controlling the screen with your Triple Cross is obscenely OP. But when you switch gears to doing a speed run, this game transforms into an uncontrollable Beast that refuses to be tamed. The overwhelming majority of mistakes turn into an unrecoverable situation. The run has audio commentary included in the video, so I urge you to listen to that for a more technical explanation of what is happening during the run. These notes are reserved for a summary of things as well as some special nuances that I perform. The Stables – This was really a perfect stage, with Rowdain even cooperating to the fullest. Dunk pose with the Orb grab. The Marsh – Another great stage. Lots of boosting and an incredible Medusa fight, she is the hardest in the game as she is 100% random and will kill you often. No orb here. Outer Courtyard – Stage here was near perfect. Also a great Puwexil pattern as he is almost as bad as Medusa. No zip in low%. Koranot was average as the ceiling drops were unfavorable. Castle Approach – I had to deal with a record number of Harpies here. Enough said. Dance hall – Missed a Chandelier cycle, but not a big deal in a Low% run. Block 6-2 is a huge improvement as I now Batman through the shiny Blobs. As I climb the second stairs in the next section, you'll see Simon crouches at the top. I did this to show that when he does the crouch animation from a big drop, you will always catch every frame of that animation. It simply can't be avoided. I also manage my health now so I don't need to Death Abuse. Downward Strike Orb pose. The Library – Taking damage early is necessary to be speedy. I get an early Red Worm de-spawn which is critical if you're grabbing the candle meat. Upward Strike Orb pose. The Dungeon – I get the early Masher Elevator in the beginning which is excellent. I miss the early Stairs, but nail the Acid boost. Then the Vegas bridge gives me all kinds of hell with that pattern. Frankenstein's Monster throws two Green Potions, but I handle it very well and don't lose any time. Reverse Jumping Orb pose. The Treasury – This stage, just wow! Jumping Orb pose. Clock Tower – This stage has a couple tricks I conceded in favor of getting the run. The risk/reward just wasn't good enough. Had really good RNG though. My execution is still as great as the prior stage. And this is only the second time I've had the optimal, four cycle Mummy. I didn't even care about the Orb pose as I was so excited. Dracula's Keep – I do just a tad of stair dancing part way through. Yes, I almost jumped to my death. The Final Four: Slogra simply can't be sped up. It is usually within a couple seconds of each fight. Gaibon went really well as he can also be deadly in Low% given his flight pattern. The Reaper is truly a monster in this category, you better show respect. Then Dracula. This was my best fight ever with flawless execution and amazing spawning for him and his attacks. Classic Orb pose. A big thing to note is that Bosses make the most difference between 'any' and 'low' percent. In low, you get to actually see what they do while fighting. It's fun and difficult at the same time. There is a little Bonus that I put into the run during the first stage. Extra credit if you noticed it on your own. Listen to the end of the audio commentary during the credits to find out what it is if you aren't sure. This is probably the hardest Speed Run I've ever completed. I hope you truly enjoy it! Behold the Holy Leather Whip. The ultimate weapon in the war against Evil.